Shattered Past, Shattered Minds is about the effect that past events continue to have on survivor’s mental health. 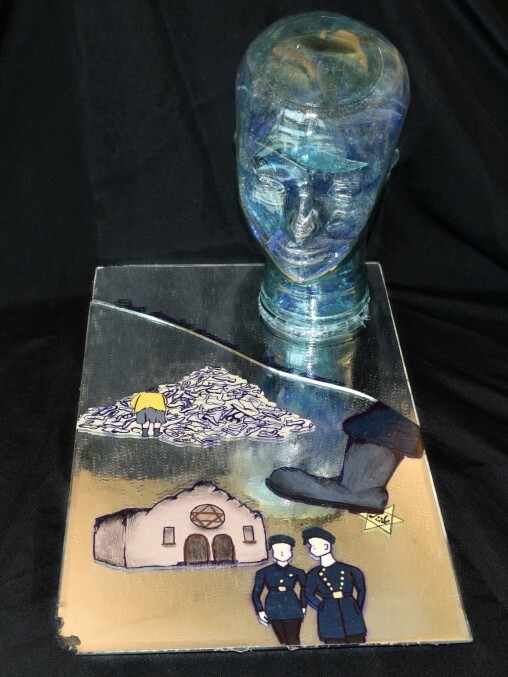 The mirrored base of my sculpture depicts moments before, during, and after the Holocaust. Two soldiers casually strolled passed a burned synagogue, unaware of the harm that their inaction is causing to the world. A boot steps on a forgotten Jew patch, as the lives of so many martyrs were trampled in the horrors of the Holocaust. And finally, a wizened old woman, struggling to rebuild her life from the leftover ruins. I decided to pain them in muted colors instead of black and white, because while that past is history, it is nowhere near forgotten. The main focus of the sculpture is the glass-filled head. This represents how the survivors are still shattered by anti-Semitic messages. Their thoughts, shattered into so many little pieces, are transparent as they sadly reflect on past horrors. However, while their thoughts are broken, they themselves remain strong in the face of hate. My hope is that my art will inspire people to view the Holocaust not as a historical relic, but a recent lesson to be learned from. My intent is that Shattered Past, Shattered Minds challenges people to tackle hate in our tumultuous social climate. 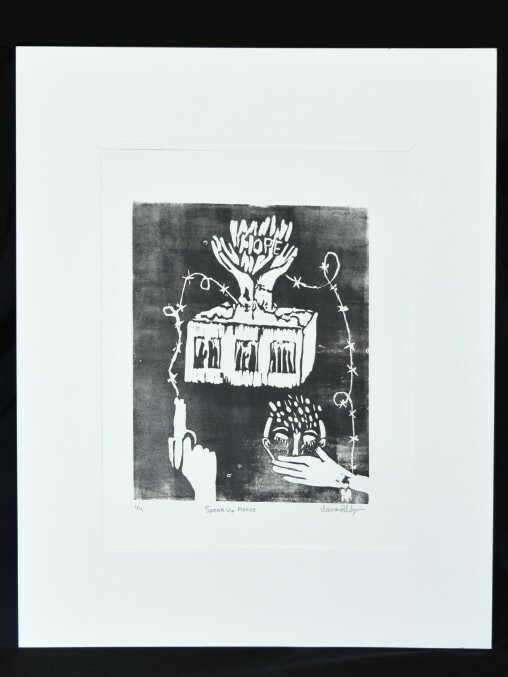 This print, titled Speak up. Please. Is a representation of what can occur when bystanders don’t attempt to help a situation they know they can. However, if someone offers a single word or action, out of the flames come hope. This offering of peace and hope is represented through the burning building, and the hands breaking out, offering the flames of hope. In addition, the building with the broken windows and flames is a tribute to Kristallnacht, as bystanders took part in the Nazis horrific plan, rather than standing up and speaking out, the person with a hand covering their mouth symbolizes the bystanders, who do nothing but sit in sadness as they watch the horrific scene. 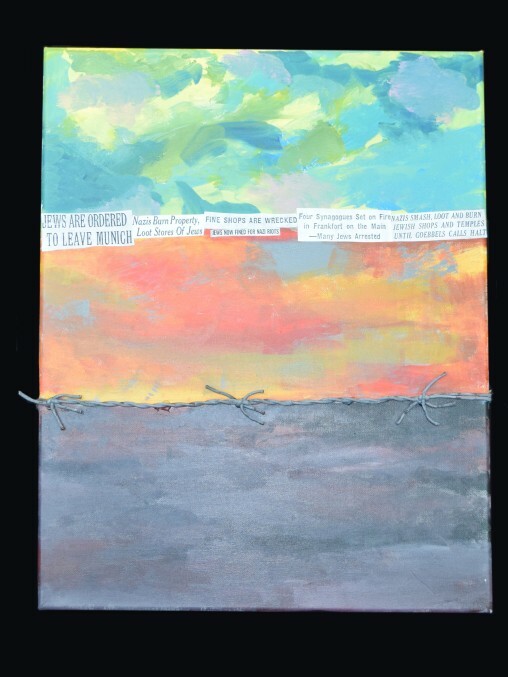 As the gun shoots barbed wire, which ties the whole print together, the hands filled with hope are restricted, as the hope would be if no one spoke up. This relates back to the Holocaust, as the horrible deeds done and the traumatizing words spoke, transformed the world. As long as the bystander has the strength and courage to become an upstander, and speak up for what is right, the flames of hope will never go out. I chose Activity #3 so I could have the opportunity to express the religious pride within the Jewish population during the Nazi takeover. I have learnt that the families forced to wear the yellow stars were not ashamed by their religion and that inspired my piece. It’s based off the concept of fighting against the oppressor by standing your ground and not hiding away what you believe in, in your heart. The Grave of Uncertain Decisions was made to highlight the action of “neutrality” can create. In serious circumstances people who are neutral are just as bad as the enemies. The piece of artwork was created by using a bowl as an outline of the grave, outside of the bowl are people in various shades of gray representing neutrality on a black back representing the oppressors. 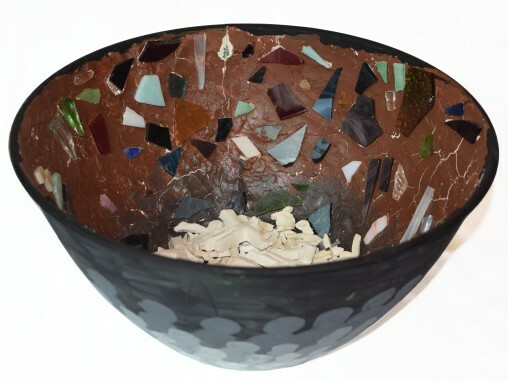 Inside of the bowl is pieces of glass scattered around representing the clay people broken dreams, identity, and possessions. And inside are people made from white clay representing the innocent lives that had been taken, though there is plenty of room for more because more uncertain people will come and take a loss without even knowing. For this art piece, I made it look as if every conflict they faced during the Holocaust, that there’s always a positive light within it, which is the faith in their religion. This is symbolized by the Star of David in the middle where anyone can shine a light to have a greater emphasis on the star. As for the maze looking part of the art, that is to show the labyrinth they all went through inside the concentration camp. With the gas chambers to starvation, they have done the worst things of all. Outside of the camp or past the camp cut out, there’s a white flower. It is to represent that there is a new beginning, awaiting for them at the end. Thousands of windows shattered marked the beginning of millions of lives lost. A lock can symbolize numerous things. Sometimes your initial thought is safety. However, in relation to the Holocaust, not only Jews but millions of people were completely torn away and locked from any and all freedom. Families, food, livelihood, basic necessities and most importantly faith were revoked from all. To much of the outside world, they became invisible much like the glass in this piece. When first reading about Kristallnacht, the imagery of the vent spoke to me. 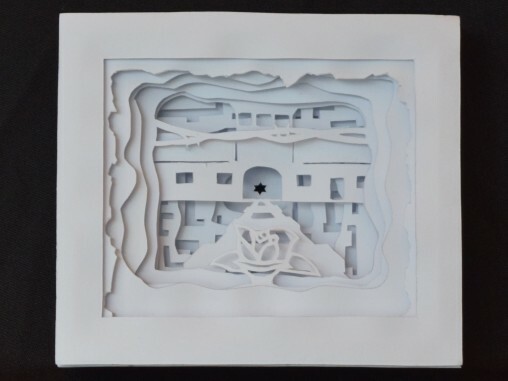 This piece is twofold: first it displays the vulnerability and fragile nature of much of the persecuted. Second: as much as these things are true, the symbolism of the lock itself is meant to demonstrate their strength despite adversity to obvious challenges. Shattered, but not broken, the survivors speak volumes about their unlocked strengths. Looking at pictures from the Women’s March, I was overcome with emotion. The fact that that many women and men were willing to stand up for and fight for what they believe in, filled me with hope. Hope that my generation will be able to pickup the fight, and by the time we are done, we won’t have to protest sexual abuse, unfair pay rates, and unequal treatment of women, African Americans, Dreamers, or anyone within the LGBTQ community. While I was stunned by the amount of people willing to stand up and have their voices be heard. I was also horrified by the reasons that the women and men were out there protesting. We should not have to protest basic human rights in the 21st century, or at all for that matter. As a society, we should learn to celebrate differences instead of looking down upon them. When I was a kid I thought everything was all sunshine and rainbows, but I was wrong. The more I learn about the world and the events that have taken place, I see it has many flaws and problems. 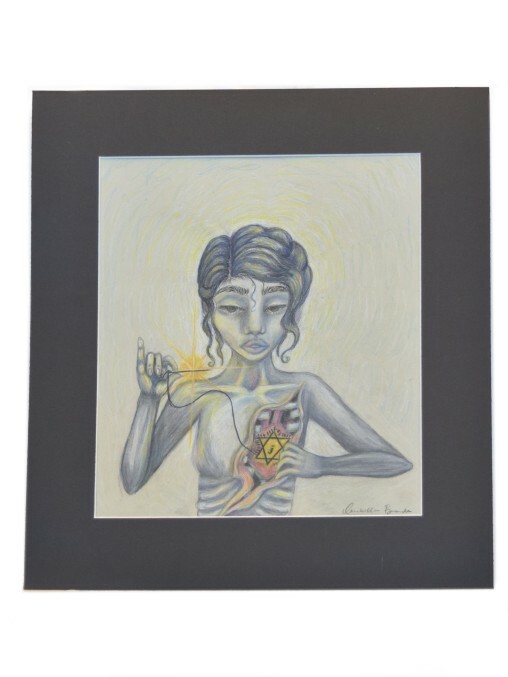 This painting represents my feelings when I learned about the Holocaust and how I think it affected the Jewish people. The painting starts off as a happy green scene with joyful colors which illustrates my simple view of the world before seeing how hatred can affect people. Then the reds, grays, yellows, and oranges represent my anger thinking of how the Nazis stormed through Jewish towns burning and destroying everything. Lastly, the dark colors are my sadness about the burned down communities and the concentration camps that the Jews had to endure because of the Nazis. I cannot imagine how difficult it was for the survivors to start their lives over. 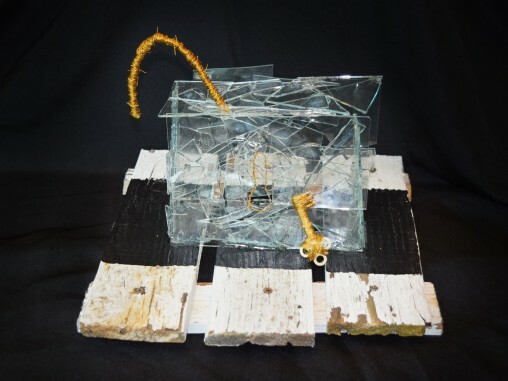 “Shattered Hope” is a piece to represent the imbalance of nature humans create. 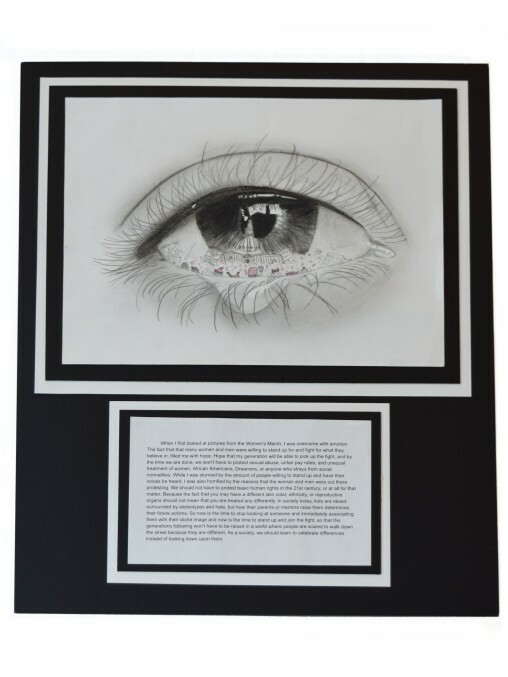 The main focus of the piece is a young girl with tears rolling down her face. This girl has no race, religion or social class, but the viewer can clearly see she is in pain. 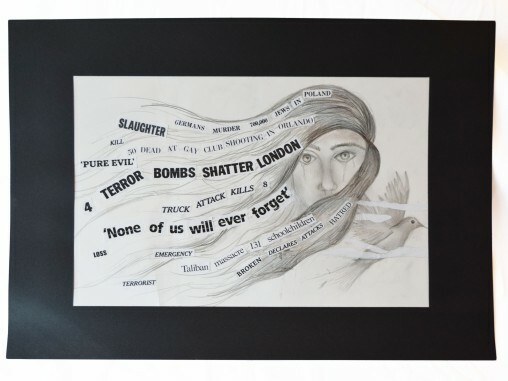 The words in her hair are headlines from terror attacks all around the world, the words are drawn from her hair which evolves into emptiness. The dove in the bottom right hand corner represents peace and hope, but the torn paper shows the flaws in the human race and their ability to live in harmony. This piece was created to show the control the humans have on the balance of nature and how destruction and pain will always be in our path. 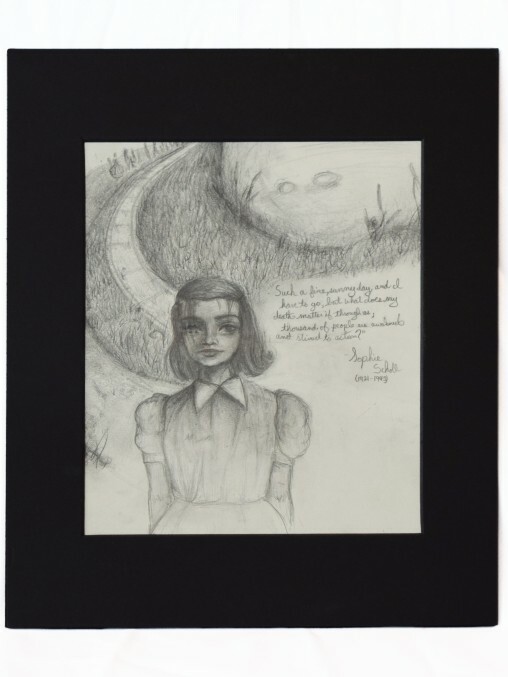 My piece for the Elie Wiesel project is a black and white pencil portrait of Sophie Scholl. Sophie was a German student and an Anti-Nazi activist. Behind her are several men, women, and children escaping Germany behind her. Some of her last words are also written next to her. “Such a fine, sunny day, and I have to go, but what does my death matter, if through us thousands of people are awakened and stirred to action?” Sophie Scholl and the other resisters may have opposed the Nazis over 70 years ago but their brave actions are still relevant today, and as long as others are silenced those actions will always be relevant. In the end this isn’t about winning a competition it’s about recognizing those who stood up and fought for what they believed in and what they thought was right. Always pick a side and defend it. Being Jewish, I’m surrounded by the terrible stories of the Holocaust. I understand how people have been perceived by others from their race and religions. My picture is of Hitler on one side, and a blank face on the other separated by the symbols of different religions. This represents Hitler and all other people like him, separating people like me, by these symbols which indicates all the religions. 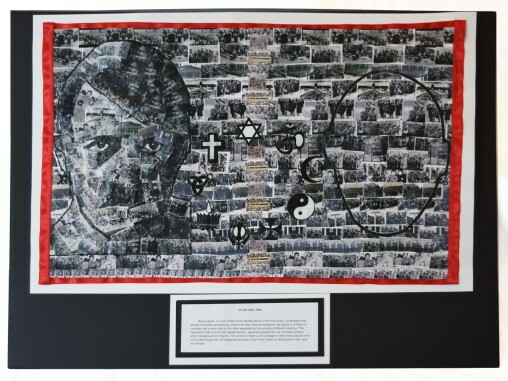 This picture is made up of a collage of other small pictures of all the horrible things that had happened because of how Hitler looked at others just for their race and religion.